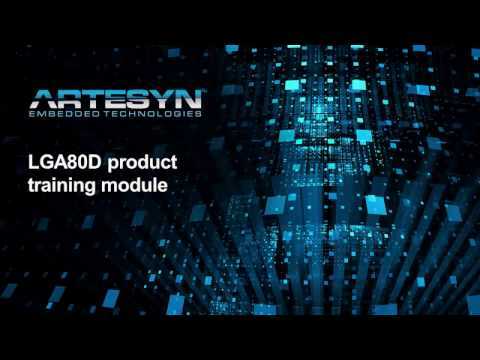 Artesyn’s LGA80D evaluation kit gives you the ability to connect the demonstration board to a USB socket on a PC, with the PMbus interface, dongle and cable provided in the kit and control and monitor the LGA80D units as they would be used in an application. There are hardware functions on the demonstration board that allow you to enable and select an output voltage by simple dip-switch settings, and the board provides voltage and ripple measurement points. The connections to the evaluation board are via M6 screws, with the only provision being that the input voltage is in the 7.5 V to 14 V range. The output connections use the same M6 screws, however, if you want to connect the outputs in parallel or you wish to stack the modules, they are placed in such a way to make the operation of placing a link between them as easy as possible. The demonstration board is populated with two LGA80D modules, allowing you to test independent channel or stacked-module operation.